Martial Views: Can Martial Artists Really Fight? Hit 'em where they ain't! This was the strategy employed by Gen. Norman Schwarzkopf during the Gulf War during the early 90's. 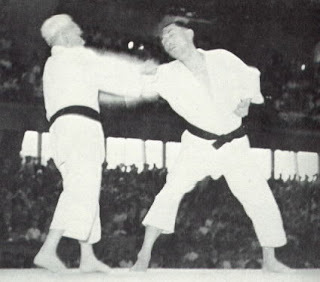 About seventy years earlier, Gichin Funakoshi, karate's quintessential grandmaster, claimed that the one who overcomes the opponent without fighting possesses the highest skill. Funakoshi's remark could be misconstrued(especially to the layperson) to mean that budoka are not really interested in combat. In spite of all the philosophical musings and references to eastern thought, such as Zen and Confucianism, do the martial arts actually need these ideals for them to be effective? More to the point, can the average black belt defend her/himself in a real-life altercation? In "Living The Martial Way" author Forrest Morgan writes, "...most martial artists can't fight...(they) just aren't trained or conditioned to be fighters." This is quite an indictment; that holding a black belt does not guarantee fighting prowess anymore than being a devout Christian assures passageway into heaven. It's all up to the practitioner. The serious martial arts aspirant knows how to fight. Maybe the real question is: Do martial artists need to fight? Perhaps Funakoshi was right after all. I think you are right on. Martial artists are trained to fight but only as a last resort. My instructor drills us on self defense techniques so we develop muscle memory. There is no time to think of what to do in a bad situation. We also do a lot of sparring. He teaches us first and foremost to try to diffuse any bad situation by using words. Or walking away. If a criminal wants my purse or my car, I'll give it to him because which is more important, my possesions or my life? If I absolutely must fight, I feel as prepared as I can be to defend myself.